For The Stress Fractures, a team of highly amateur runners assembled for a single day’s heroic shenanigans, trouble came — for the first time — 40 kilometres outside of Jasper, Alberta. It was 1:30 pm and crowding 27 degrees C. One hundred and sixty two competitors, strung out along the shoulder of Highway 93, were baking like macaroons. And the thing about the Jasper-to-Banff relay is, you can never really prepare for heat, because the moment you do you’ll get snowed on. Such are the cruel variables of the Rockies in June. The Stress Fractures had front-end loaded their squad, with strong runners in the first three of the 17 legs, and were actually in a respectable position—around 35th place — when the third guy, Alan Cassels, came threshing into the exchange area and handed off the baton. 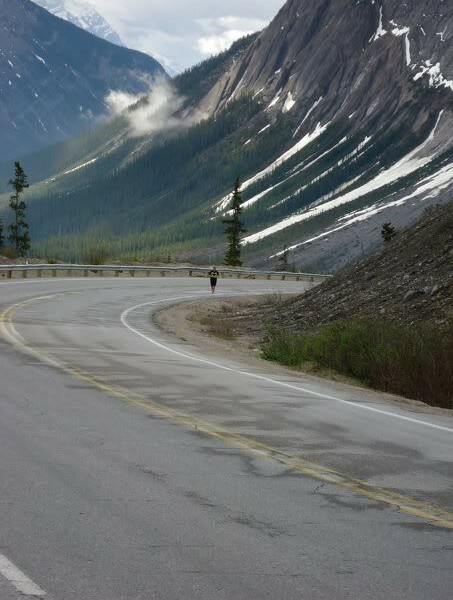 Runner 4, not wanting to embarrass himself, was giving it all he had, spraying pea gravel across the long shadows of the mountains of the Athabasca River Valley, his gait so ungainly people actually remarked on it as they cruised past in support vehicles. Or so I heard later. Runner 4, you see, was me. It was some Jesus hot. The last kilometer of my leg climbed to a ridge, and as I approached it our next runner, Patrick Maguire of Victoria, swam into view. I waved the baton in Patrick’s direction, he reached for it, and… all went granular. Wildflowers were in bloom beside the highway. It was quite a lovely place to lie, drinking through a vein and contemplating what made this annual event so great; what made it, as one American running publication gushed, the best organized and most beautiful relay race in the world, anywhere, anytime, ever.” The premise was simple. Each team had 24 hours to move a glow-in-the-dark baton 288 kilometres. (Exceed the time limit and your only reward was in heaven, because you were disqualified.) There were teams from Switzerland, Peru, the Netherlands, the Cayman Islands, all over the US — and every year a squad of thoroughbreds from Japan that was rumoured to have a couple of Olympians and a partially bionic guy on it, a team that perennially surged into the lead from the get-go and wasn’t seen again until they emerged from Melissa’s the next morning with pancake crumbs on their shirts. Adventure races are no novelty any more, but this one broke ground when it started in 1980, and it retained a certain aura. Bottom line: it got city people away from their desks and into the subalpine, and contrived for them an unmatchable wilderness experience. For one day, parts of a highway that moves a million cars a year were empty but for support vehicles. It was like flipping back the calendar to 1929, before there was a highway here. By dusk, the competitors were so widely separated that each had the sensation of being completely alone. Slip the baton behind your back and there was not a human-made sight or sound to betray the illusion that you had been air-dropped in the middle of nowhere, in the middle of the night, in the middle of winter — the sort of circumstance that’s likely to produce a vision, or a change in life purpose. Or at the very least, if it happened to involve a midnight encounter with a grizzly sow and her cubs near the Bow Summit, a change of underpants. Alas, those wildlife encounters, and complaints over the disruption of traffic, and concerns over the environmental impact—the Parks Board began to demand that organizers pay for a study of the race’s environmental impact—proved to be an even bigger bear. In 2000, the race was re-invented, with a slightly different format. It’s now broken in two, with the two halves run simultaneously in the daylight, so it’s over by dusk. Without the night legs, it lacks a little of the mythic, gotta-get-this-message-to-Marathon feel. But it’s safe to say that everyone who ever ran it has a different appreciation of that stretch of road—and probably, of nature itself. There’s a strong case to be made that that usual way to see the Parkway – by car – is the best way. The entire linked chain of five river valleys spools past in about the time it takes to watch Brokeback Mountain (which was filmed nearby), and you can Tivo-pause at any time to pull over for a hey-Martha view of the Kerkeslin Goat Lick or Bridal-Veil Falls. You’re barely aware of the car gearing down as it climbs up out of the subalpine forest and noses over wind-hammered passes that rival the altitude of the high points on the Tour de France. But for me, completing the route – or at least a little slice of it — on foot personalized the Icefields Parkway in a way that’s a bit hard to explain. I can’t drive it now without experiencing the road as a necklace of 15-km-long segments, each of which I conflate with the friend who gritted his or her teeth and knocked that leg off, bringing the team in under the limit, beating the clock in the way that felt like a metaphor. It’s like what’s supposed to happen in the nanosecond before you die: a parade, before your eyes, of the faces of the people who mattered to you the most while you lived.